Reimar Schlingensiepen succeeds Prof. Hans Rommelspacher, the founder of AudioCure, as CEO. Rommelspacher will continue as CSO. AudioCure recently secured funding of about 9 million euros in a Series A financing round from Austrian MED-EL Elektromedizinische Geräte GmbH, German investor High-Tech Gruenderfonds and private investors. Berlin, 22 May 2017 – AudioCure, a German pharmaceutical company focusing on the development of treatments for hearing disorders, announced today that it has appointed Dr. Reimar Schlingensiepen as CEO. Dr. Schlingensiepen has been with AudioCure as COO since July 2015. During that time, he has successfully reshaped the company and carved out the recent series A financing round of about 9 million euros. He takes over from Prof. Hans Rommelspacher, who will continue as CSO. “With Reimar´s deep commitment to AudioCure, his proven track record and over 20 years of experience in the biopharmaceutical industry spanning preclinical, clinical and product development, I could not have wished for a better person for the job of CEO,” said Prof. Rommelspacher. Since 2008, Dr. Schlingensiepen has worked as entrepreneur and manager in the fields of biopharmaceutical development, med-tech and diagnostics. He co-founded a number of high-tech companies, where he held several management positions. In addition to his leadership and biopharmaceutical expertise, he brings to AudioCure substantial experience in manufacturing, marketing and finance. It is of great advantage to AudioCure that, as a medical doctor, Dr. Schlingensiepen also conducted a variety of clinical trials in oncology, immunology and neurology. With AudioCure, Dr. Schlingensiepen´s immediate goal is to steer the company’s first in class front-runner molecule AC102 through its formal preclinical development. This is a prerequisite for the clinical development, which is planned in patients with auditory disorders including acute hearing loss and acute tinnitus. 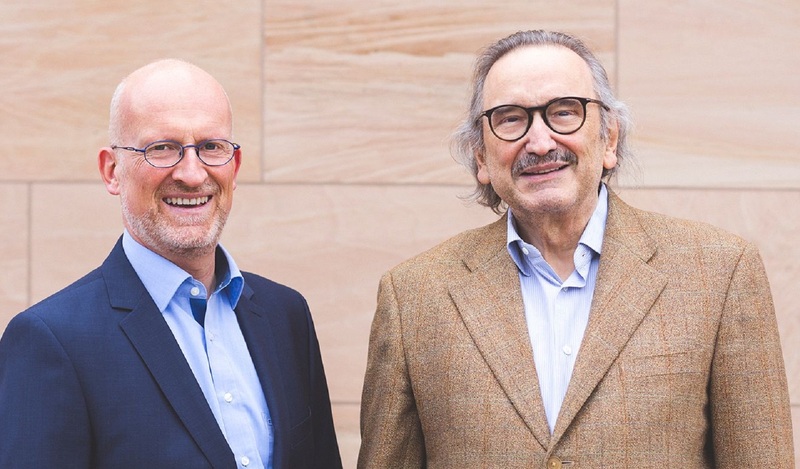 Dr. Reimar Schlingensiepen (left), the newly appointed CEO of AudioCure Pharma GmbH, takes over from Prof. Hans Rommelspacher, founder of the company, who continues as CSO. AudioCure Pharma GmbH is a pharmaceutical R&D company headquartered in Germany and founded by Prof. Hans Rommelspacher, MD and CSO. As the former head of the Department of Clinical Neurobiology in the Psychiatric Clinic at the Charité University, Berlin, Prof. Rommelspacher has extensive experience in neuroprotection and treatments for neurodegenerative disorders. It is Prof. Rommelspacher’s scientific expertise and lifelong dedication to neuroscience that led to the discovery of AC102, the company´s front-runner molecule. AudioCure’s preclinical models have demonstrated the unique potential of AC102 to tackle all three crucial types of cells of the inner ear affected by hearing loss: the inner hair cells, the outer hair cells and the acoustic nerve. By protecting and restoring the cellular key players that are critical to the hearing process, the therapeutic approach of AudioCure goes beyond treating symptoms to tackle the root cause of hearing loss.